Jenny is a wedding dress designer. She makes the dresses on the days that women dream about as being the “most perfect day of their life”. Recently, Jenny divorced Dr. Wonderful- seriously, the man does Doctors Without Borders, fixes cleft palates for children, and is so nice, it’s almost sickening. With Jenny being divorced and her ex-husband and his new wife wanting to keep Jenny in their life- it’s time for a relocation for the wedding designer. So, she leaves Manhattan and moves to a nearby area- where her older sister, Rachel, lives. A place that Jenny hopes to grow and live her own life- maybe find a man, be closer to her nieces, and spread her wings. Rachel is so excited to have her sister back in town. Jenny will be super fun to hang out with, the triplets love her, and oh yeah- Rachel needs her since she just found out her husband is having an affair. Two sisters- both have seen the flip side of marriage. Jenny was able to get out of hers without too much emotional damage and Rachel, well, she’s unsure what to do. She feels she has so much to consider- a fact that makes Jenny wonder if she needs to reveal a secret about their parent’s marriage. Being a recent fan of Kristan’s Blue Heron series (the past 2 books, anyway)- I have enjoyed Kristan’s humor in her leading ladies. When I heard she was dipping her toes in the realm of women’s fiction, I was so ready for this book. The cover. Gah, so eye-catching. So pretty. So “look at me, I must be on your bookshelf”! The plot: Loved the idea of sisters- one recently being divorced and one trying to decide what she should do about her husband. Jenny and Rachel: as sisters, they knew how to stand up for each other AND poke each other in the sensitive places. Both characters were delightful- the yin/yang of their relationship, how Jenny was the protector of Rachel- it felt very believable. Leo: Sure, there is some baggage- but he’s hot and he’s got some one liners that made me grin. The humor level. IF YOU ONLY KNEW has humor, it really does. But, it’s def not the level of humor that I had come to expect from some of Kristan’s previous books. 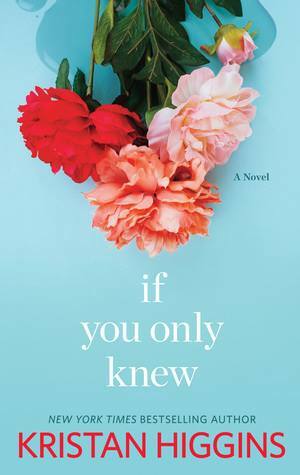 IF YOU ONLY KNEW focuses more on the sister’s relationship- the good and the bad side. Kristan is trying on a new look- and it’s one that I think will work for her- IF you don’t go in expecting leading ladies exactly like Blue Heron ones. The mother- Good grief, that woman was annoying. No wonder Jenny had issues with Owen. Bottom line: Really enjoyed this book. While I’m eager to return to Blue Heron, the introduction of the women’s fiction side of Kristan Higgins is one that I am eager to learn more about. Would love to hear from Jenny and Rachel in a later book- similar to how Emily Giffin lets characters from past books visit new books. I’m looking forward to this one. I’ve not read anything by Higgans before, so I’ll get to go into it with no pre-expectations. Yay! I def think the way you are going in is best. Her Blue Heron books I’ve read are very good- but it’s a different feel than IYOK. I too really enjoyed her foray into women’s fiction and hope she will carry on the sisters story into another book. Love all her books, but I personally like women’s fiction so always happy when authors go that way.